Mentioned within a post on the official Target pressroom earlier today, Target CEO Gregg Steinhafel has resigned as of today after spending 35 years at the company, six of which were as the CEO. Steinhafel’s resignation has been specifically attributed to the massive credit card data breach that’s potentially impacting more than 100 million Target customers. Taking over for Steinhafel during the interim, Target chief financial officer John Mulligan is taking over as the interim president and chief executive officer while a search is ongoing for a permanent replacement. With early estimates in the 40 million range, the impact of the data breach has tripled in size with analysts estimating between 110 and 130 million accounts could be at risk. Using a form of malware, hackers were able to gain access to Target’s point-of-sale system and pull credit card information for a couple weeks without being noticed. After the breach in security, Target encouraged customers to work with credit card companies to change card numbers and offered 1-year of free credit monitoring from Experian to anyone that was impacted by the security lapse as an apology. One of these steps includes hiring Bob DeRodes as the company’s new chief information officer. With a background that includes consulting work at Department of Homeland Security and the Department of Defense, DeRodes seems like a solid fit to beef up the retailer’s internal security and make sure a similar data breach won’t occur in the future. Interestingly, Target is leading the way to transition to the new chip-and-pin credit cards faster than the major credit card companies. 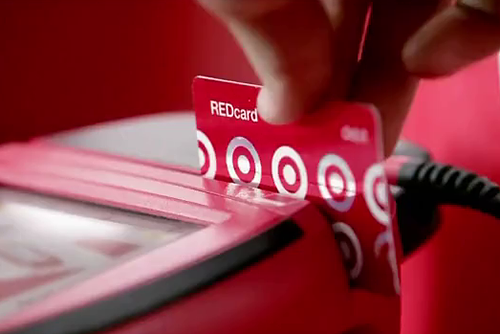 With a tiny chip embedded in the Target-branded card, users must enter a secure password when checking out at the retailer.